All this week on Table Talk, we are talking benchmarking, or comparative analysis. Farm benchmarking involves understanding your performance and profitability over time and how that compares to other like-businesses. This can be done at a whole farm level or an individual enterprise level and can help to identify gaps and opportunities in your operation. We’ve rounded up some quotes from farm benchmarking experts to answer some frequently answered questions to unpack the concept and how it can be a helpful tool to analyse and improve your business. What is the history of farm benchmarking in Australia? What does the farm benchmarking process involve? 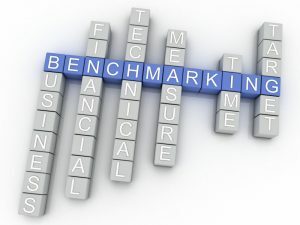 Benchmarking is the practice of establishing the relative performance of a business or enterprise against an appropriate standard, generally industry standards derived from a survey of farms (Franks, Collis). Benchmarking is the comparison of performance with the performance of others engaged in a similar activity and learning from the lessons that these comparisons throw up (Ashworth, 2002; Spendolini, 1992). It involves the action of continuously measuring and assessing products and services and practices against those of world-class businesses or top competitors (Slavin, 1994). It is about borrowing good ideas from others about how to improve (Brown, 1995) (Franks, Collis). Benchmarking is an ongoing practice aimed at continuous improvement which aligns with an increasing interest in quality assurance procedures for production, marketing and business management systems (Charles Sturt University). Perhaps the simplest one-phrase response to the definition (of benchmarking) would include reference to ‘learning from others’ :….learning something new and bringing new ideas into the (business) (Spendolini 1992) (Ronan and Cleary). Benchmarking, in its proper process-based form, is about what things are done on farm, how they are done and what are the consequent productivity and financial outcomes (Ronan and Cleary). The roots of current farm benchmarking efforts go back to the 1960s, when farm business performance was measured through performance ratios and comparative analysis. State Departments of Agriculture played a major role in developing management studies and comparisons within or between farm samples from a number of rural industries (Ronan and Cleary). Probably the first national move into benchmarking in Australian agriculture was initiated in the Grain Research and Development Corporation’s (GRDC) Farming and Sustainable Technology (FAST) Project, commenced in 1992. This project generated a range of ‘Business Health Benchmarks’ (Ronan and Cleary). By the mid-nineties, benchmarking reviews were noting the existence of many farmer group services based on or including ‘benchmarking’. However, these reviews were also recording a low overall participation rate by farmers, no consistency between approaches and a focus on numbers – particularly financial measures – rather than the farming processes and practices that give rise to the numbers (Ronan and Cleary). Despite its process-oriented, enterprise-based roots, the phrase ‘benchmarking’ has now loosely been applied in Australian agriculture to all forms of business comparative analysis, regardless of whether or not these have a process-based, best practice focus (Ronan and Cleary). The use of physical and financial performance indicators and benchmarking for the financial analysis of farming businesses is a widespread practice in Australian agriculture, though its use has fluctuated over the years (Charles Sturt University). Benchmarking can be either indirect — where producers calculate their own performance indicators and compare them against published industry benchmarks; or direct — where producers contribute their farm information into a service which generates the benchmarks for comparison with other sheep producers (Making More From Sheep). Benchmarking requires the measurement of aspects of the production process. These are used to generate quantitative measures of selected key performance indicators (KPI) which describe the competitive performance and the production process achieved and used by the average and best farms. To compare own KPI to the basket of KPI presented in the benchmark comparisons, it is important that an identical methodology is adopted by the farmers as that used to report the benchmark data (Franks, Collis). Related to ‘comparative analysis’ in that it involves the comparison of a performance indicator derived for one business with the same performance indicator derived for one or more other businesses. However benchmarking also incorporates a focus on the production (physical and technical husbandry), ecosystem resources management, human resources and business management practices / processes used in the business. Benchmarking therefore focuses on the key variables influencing productivity, profitability, liquidity and solvency (Charles Sturt University). ‘Best practice’ benchmarking is distinguishable from comparative analysis, and some present so-called ‘benchmarking’, by: being activity-based and systemically linking enterprise processes to efficiency, profit and cost; being part of the enterprise and farm information system and a contributor to production economic and whole farm analysis (not an end in itself for decision-making); providing unambiguous information, displayed clearly and systematically (Ronan and Cleary). What are the benefits of farm benchmarking? What are the limitations of farm benchmarking? Why aren’t more farmers benchmarking? And, in our final post, we will help you get started on your benchmarking journey. Head over to our Farm Benchmarking Toolkit to learn more.